Retro Folding Hand Fans,exquisite workmanship, great choice as a present. It looks like the peacock spreads its tail when open the fan. It is a delicate styling tool for girls, ladies, women to dress up, make you unique in the crowd. You can be the focus at kinds of party. It is small size in folding status, easy to keep it in your bag. WHAT WE MAKE: Our Vintage Folding Hand Fans are made of fabric fan cover and plastic fan bone frame. Handmade Beautiful Chinese handheld folding fan has high quality traditonal silk fabrics. It gives you a exquisite experience. 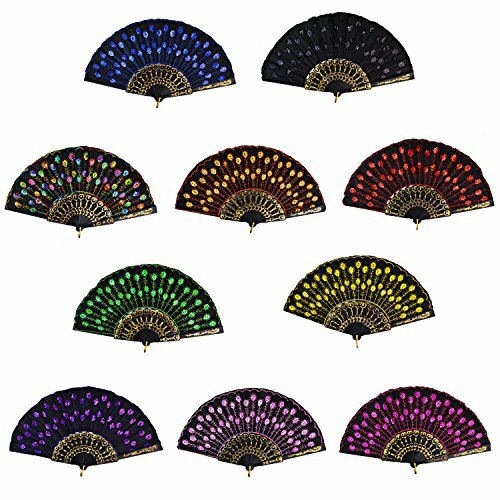 WHAT YOU GET: These beautiful handheld fans are about 9.4 inches long and 17.7 inches wide when they are opened, 1 set include 10pcs random color combinations. These would be great for a themed party or effective if handed out during a summer wedding. SPECIALLY DESIGN: There is a hoop at the end which is actually for a wrist strap, you can decorate with them, for example each piece on the end have your own design to make the fans look pretty. Decorated with lace around edge, can be used to decorate a room, for a party or Halloween costume. WIDE APPLICATION: It's great for keeping cool, folds into small space. Whenever you bring it for matching your wearing or dancing in public, it always serves to let you be a attractive focus. Such a well handmade unique design fan can also act as a good decoration for your house. CLASSIC TRADITIONAL FEATURES: These fans mix Chinese traditional characteristics and European elegant features together which can give you a better using experience. If you love Chinese tradition culture, come and buy our Folding fans. If you have any questions about this product by Rbenxia, contact us by completing and submitting the form below. If you are looking for a specif part number, please include it with your message.